Welcome to the new wiiw website! wiiw has given its website a face-lift and has introduced new, user-friendly features: easy access to major statistical databases, to research projects and publications and regular news about its work. The relaunch was developed by the Austrian graphic design studio Weissgrad, in cooperation with wiiw project manager Ronald Hartwig and programmer Goran Paunovic. The aim of their joint endeavour was to provide the public with quick, easy and intuitive access to wiiw data, analyses and information. Furthermore, the graphic design is supposed to reflect wiiw’s organisational values, such as professionalism, competence, modernity, innovation and independence. The very start page already allows a quick overview of what is going on at wiiw. The News section provides condensed articles about our current activities; the section ‘Upcoming Events’ draws visitors’ attention to our conferences, seminars and lecture series and ‘Recent Publications’ to our scholarly publishing series. The section ‘Current Project in Focus’ features single research projects. 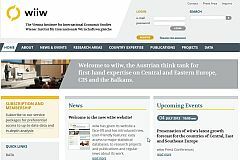 A major feature of the new website is the easy access to wiiw’s statistical databases on Central, East and Southeast Europe (CESEE). Through a single interface visitors can access the wiiw Annual and Monthly Databases, which contain up-to-date and comparable macroeconomic statistics on 19 European emerging economies, as well as the wiiw FDI Database, which captures FDI flows and stocks in 22 emerging economies. The interface provides easy and user-friendly access and a search function allowing the saving of queries as well as downloads in various formats (Excel, HTML, CSV, TSV). The wiiw project management invested major efforts to document, update, standardise and inter-link major research projects wiiw has been undertaking over the past three years. The resulting online project database now presents a quick overview of recent and current research projects, of our partners, clients and research. The advanced search function allows a systematic search by client, topics and countries. We believe our visitors will also be pleased with the improved website navigation, advanced search functions within our Publications and Projects sections as well as the intense cross-linking of all contents. If you should encounter any problems with the new website, please contact us at customerservice@wiiw.ac.at.